The government of India has made mandatory to link your PAN CARD (10 digit permanent account number) with your Aadhaar card (12-digit aadhaar number issued by UIDAI) for income tax return file. The sources say, end of this year if your PAN Card is not linked with your aadhaar card, then your pan card will become invalid. So if you have PAN CARD (no matter you are tax payer or not), you have to link it with your aadhaar card. Today we will tell you how can you Link your PAN CARD with your aadhaar card. Step.1: First visit income tax department Link Aadhaar Page. 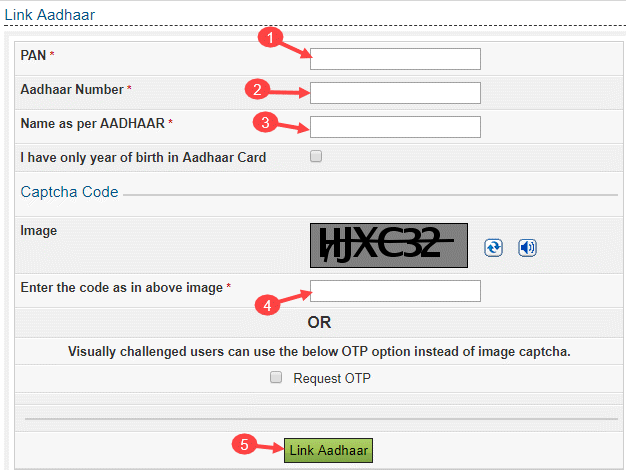 At Link Aadhaar Page you have to enter PAN number and Aadhaar number. Fill (*) mandatory details. Now Enter CAPTCHA code and click on Link Aadhaar. That’s it, next screen you can see successful linking message. Some users facing errors while they link pan card with aadhaar card. Most of time Aadhaar card and pan card name not matched, so check your aadhaar-pan name details. If you find any mismatch in name then simply correct your aadhaar card name. Once your aadhaar name updated, you can link with pan card. And here is another method to do this work. Income tax department has launched SMS facility. If your PAN card and aadhaar card name same then you can easily link both via sms. So by following these steps you can link pan card with Aadhaar card online.